The 18-year-old sports and exercise science student is a member of City of Sheffield Swim squad but cannot claim to be the most famous Litchfield at the club, as he trains there with his older brother Max, who competed at the Rio Olympics. But now Joe will be going for his own success, as he heads to Asia for the World University Games (WUGS) – a competition at which Olympic champion Jessica Ennis-Hill and London 2012 bronze-medal winning gymnast Beth Tweddle have previously competed. 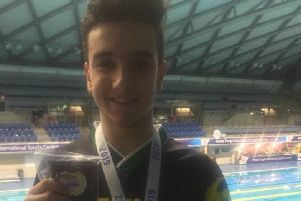 Originally from Pontefract, Joe was encouraged by watching his sibling compete in Brazil last summer and hopes it can spur him on to achieving Commonwealth qualification at the WUGs. “We were out in Rio watching Max in the Olympics and to experience the Games was incredible, it made me think, ‘I want to be there one day,’ whether that’s Tokyo or 2024. “Watching Max was great, he got in the final, then before the final he was really nervous and he got fourth and it was just incredible. “We’ve trained together and I always want to beat him, at the moment he’s got more endurance over me whereas I’m more fast twitch. “I want to make the Commonwealth Games next year and the WUGs are a qualification meet for that. “Every summer meet is a qualification for the Commonwealths, there were trials at Ponds Forge last month and that was the first qualification meet. “Hopefully I’ll get picked from these Games, the earlier I can get it done the better. Held biennially in major cities across the globe, the World University Games (WUGS) sees athletes come together to compete across numerous sports with the Summer Universiade the second largest multi-sport event after the Olympics. The former Doncaster Dartes swimmer is one of almost 10,000 participants, from over 170 countries expected to compete at the Games which will be held in Chinese Taipei from August 19 to 30. Team GBR is preparing to send its largest delegation to the Games since 2011, with over 110 athletes set to compete across 13 sports. Litchfield will take part in the 400m and 200m individual medley as well as the 100m butterfly in Chinese Taipei and hopes his gold-winning performance at the European Juniors last July will make him one to watch. “I did the European Juniors and won gold which was a great experience, to see myself actually getting first was the first time I’ve been really successful at junior level so hopefully I can carry that through to seniors,” he added. n British Universities & Colleges Sport (BUCS) is the national governing body for Higher Education (HE) sport in the UK, organising leagues and competitions for more than 150 institutions across 52 different sports. Over 110 athletes will represent the GB team at the 29th FISU Summer World University Games 2017 from 19-30 August.